PYONGYANG—The recent appearance of former Chicago Bulls forward Dennis Rodman in North Korea was reportedly the most normal thing to transpire in the country in recent memory, sources confirmed Tuesday. 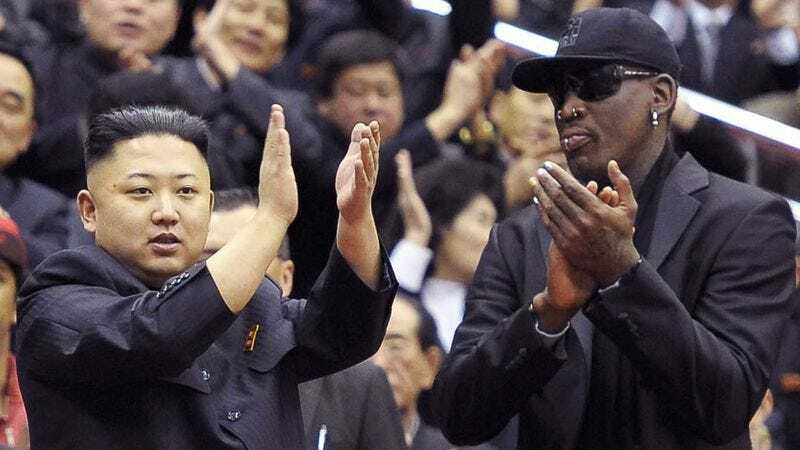 “Our Supreme Leader [Kim Jong-un] was pleased to share in the company of Mr. Rodman as the two enjoyed time together conversing, dining, and watching basketball, which honestly was just about the most ordinary thing I’ve ever seen around here,” an anonymous source within the North Korean government said of the flamboyant NBA star’s relatively conventional diplomatic visit, which reportedly featured little of the group chanting, elaborate costumery, and synchronized acrobatics that define everyday life in the East Asian nation. “Really, this was just a run-of-the-mill episode in which the leader of North Korea spent a couple of days with a 6’7” tattooed Hall of Famer known as ‘The Worm.’ And I guess a few of the Harlem Globetrotters were here at one point. Pretty standard stuff, all things considered.” At press time, North Korean authorities had reportedly taken the unidentified government contact into custody for communicating with Western media, thereby signaling a return to the nation’s customary routine.